While the National Recovery Administration, created in 1933, theoretically guaranteed workers the right to unionize, company bosses continued to fire (and shoot) employees who went on strike for the right to form unions. In 1933 John L Lewis formed the Congress of Industrial Organizations (CIO). Unlike the American Federation of Labor (AFL), membership in the CIO was open to blacks, immigrants and communists (women continued to be shut out of the union movement until World War II). For political reasons, the New Deal right to unionize didn’t extend to agricultural workers. The primary New Deal farm program was the Agriculture Adjustment Act, which gave plantation owners direct payments for destroying surplus cotton crops. Despite federal requirements that owners share their payments with tenant farmers* and sharecroppers,** they rarely did so. Both approached socialist leader Norman Thomas, who helped them organize the Southern Tenant Farmers Association (STFA), which had 1,000 members by the end of 1935. Arkansas lawmakers responded by evicting tenant farmers and share croppers suspected of organizing, murdering black members and passing ordinances banning public gatherings. Despite white terrorism, the STFA organized a successful cotton pickers strike (for higher wages) in 1935. In 1938, Congress finally passed legislation granting direct federal relief to tenant farmers and sharecroppers – plantation owners responded by evicting 251 families in order to keep the relief payments for themselves. *A tenant farmer used his own seed and animals to cultivate an owner’s land and paid him 1/4 of his crop for this privilege. **A sharecropper used the landowner’s seed and animals and paid him 1/2 of his crop for this privilege. *** Aside from FDR’s inherent racism, southern tenant farmers and sharecoppers didn’t vote because they couldn’t afford the $1 poll tax. More importantly the President relied on the votes of southern Democrats to pass New Deal legislation. It’s clear from Zarlenga’s extensive documentation and footnotes that the research for this book took decades. He essentially rewrites western history dating back to the ancient Sumerians. His goal is to expose and correct all the distortions and myths introduced into official history historians in the pay of merchants and bankers. Both are fiercely committed to perpetuating our current global monetary system in which private central banks create and control the money supply. Among many others, two of the myths Zarlenga explodes are that the Roman Empire collapsed due to barbarian invasion (he demonstrates very convincingly that Rome collapsed due to a debasement of their currency) and the often repeated claim that excessive government printing of money was responsible for the deadly inflation in the early years of the Third Reich – as Zarlenga points out, it was actually the privately owned central Reichsbank that issued the money and created the inflation. 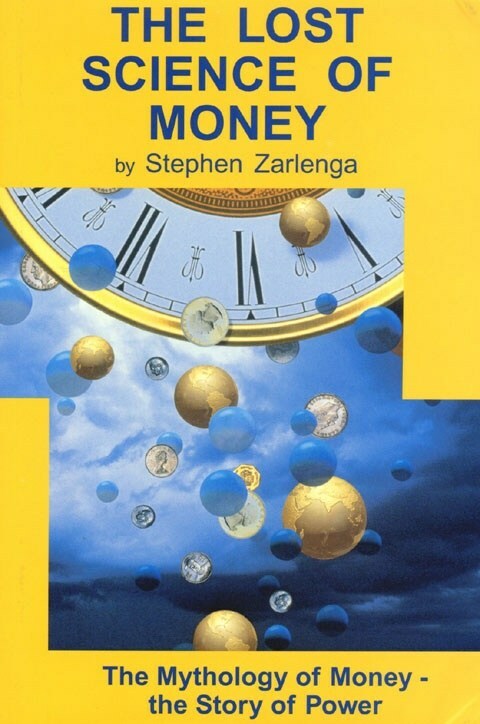 Zarlenga begins by establishing a clear difference between “true money,” which he defines as money with a fixed value set by law and “commodity money,” in which private merchants and banks issue and control the value of money. In the rare historical periods where governments have issued and controlled money by law, the result has been long periods of political stability and flourishing industry and culture. The Romans enjoyed the longest continuous period (200 years) of monetary stability. Roman leaders maintained control of their money by prohibiting silver and gold coinage for domestic use – issuing fixed value copper and bronze coinage instead. In this way they prevented foreign merchants from capturing control of their money supply and manipulating the value of their currency. Zarlenga carefully traces how after the fall of the Roman Empire, control of western money shifted from Constantinople (after the 4th Crusade which sacked Constantinople – see link), to Venice, to Portuguese traders in Antwerp (after they opened the trade route around the southern tip of Africa), to Amsterdam (following the civil war splitting the Netherlands into Holland and Belgium), to London (after the Dutch prince William of Orange seized the English throne). In each case, control of the money supply was far more important than military strength in consolidating political control. Zarlinga also clarifies, though careful research, the historical role played by the Knights Templar and Jewish merchants and money lenders in the development of global monetary centers. One of the sections that interested me most concerned the founding of the Bank off England – which set the global standard for all private central banks – in 1694. Previously I hadn’t realized that the Bank of England was started by a Dutch king (William of Orange), who usurped the English throne from James II. Nor that his purpose for chartering the Bank of England was to advance the interest of the Dutch merchants and bankers who initially controlled it. I also enjoyed the detailed section outlining the history of government issued money in the US. Again Zarlenga presents extensive and convincing evidence that it was the ability of colonial governors to issue their own money that enabled commerce and industry in the 13 original colonies, as well as enabling them to organize a successful war of independence against England. Zarlenga also describes in detail the battle Jefferson, Andrew Jackson and their allies fought against the creation of a privately controlled central bank, as well as the immense popularity of the Greenback Congress issued during the Civil War – and the immense national uprising (the populist movement) launched at the end of the 19th century to save them. Obviously the book wouldn’t be complete without a chapter on the criminal conspiracy that lead to the formation of the Federal Reserve in 1913, the Federal Reserve’s role in engineering the Great Depression 26 years later, and Roosevelt’s prolonged battle with Wall Street to implement the New Deal recovery. In this presentation, Naomi Klein outlines the strategy she feels grassroots activists need to pursue to resist the growing attacks on working people while building build a genuine alternative to post industrial capitalism. It’s very similar to the one Kali Akuna proposes (see Don’t Just Fight, Build). While she begins by focusing on climate change, she heavily emphasizes that environmentalists alone can’t solve the crisis of catastrophic climate change – that it will require a large diverse coalition of activists organizing around a broad array of environmental and social justice issues. While she doesn’t state directly that it’s impossible to prevent climate change under capitalism, this is strongly implied. Another concept Klein stresses is the importance of radical ideas in creating the conditions for major reform. She gives the example of the calls for socialist revolution following the 1929 Depression and during the Vietnam War – how serious discussion of revolution scared the corporate elite so much that they granted major economic reform (the New Deal) under Roosevelt and major environmental reform under Nixon (creation of the Environmental Protection Agency, the Clean Air Act, the Clean Water Act, etc.). Klein also gives the example of the Leap Coalition in Canada, which is working for bold social and environmental justice reforms, as well as the development of community controlled energy systems (similar to Germany’s) – where the profits from energy production fund community services, such as teaching, daycare and senior care – rather than distant corporations. In this presentation, author Thomas Franks talks about his recent book Hey Liberal, Listen Up: Or, What Ever Happened to the Party of the People. The focus of his latest book is the blue collar backlash that has resulted in the probable selection of fake populist Donald Trump as the 2016 Republican presidential candidate. Franks places the blame for this squarely on Democrats, owing to their abandonment of working people. Franks most shocking revelation is that Clinton took office in 1992 with a deliberate determination to repeal the New Deal. In 1997, he made a secret deal with Republican House Speaker Newt Gingrich to ram a bill through Congress privatizing Social Security (which Clinton mentions in his 1998 State of the Union address). Thanks to the Monica Lewinsky scandal, this bill never happened. 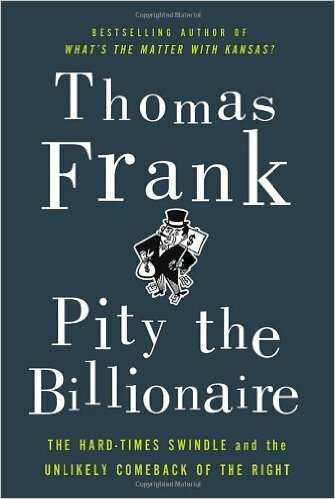 Pity the Poor Billionaire describes how the right wing corporate elite used the 2008 economic crash to build a pseudo-populist movement (aka the Tea Party) to build blue collar support for harsh free market austerity policies that benefited Wall Street at the expense of working people. According to Frank, the Tea Party was the fourth conservative uprising in the last half century. The first was the backlash against the anti-Vietnam war movement that resulted in Nixon’s election in 1968 and 1972. The second was the Reagan revolution in 1980; the third the Contract with America revolution that won Republican control of Congress (in 1994) during Clinton’s first term. With each of these movements, US political and economic life became increasingly conservative, with all public institutions – churches, hospitals, universities, museums, the US Post Office and even the Army and CIA – succumbing to pressure to operate according to free market principles. The same period saw the virtual demise of both labor unions and any organized US left. Nevertheless, according to Frank, right wing strategists managed to flood the media with rhetoric ramping up popular fear the left was “on the march.” It mainly focused on a fictitious behind-the-scenes conspiracy to provoke a crisis – through overspending that would collapse the US economy. This messaging, crafted by right wing think tanks funded by right wing billionaires like the Koch brothers and delivered by Glenn Beck, Russ Limbaugh and similar right wing celebrities, was spectacularly effective in convincing a majority of Americans that the neoliberal corporatist Obama is really a socialist. They did this by using Tea Party protests and right wing media to sway public anger away from Wall Street and onto the government. Via sophisticated psychological propaganda, working people were systematically conned into believing their interests coincide with those of Wall Street corporations. *Astroturfing is the practice of masking the sponsors of a message or organization to make it appear as though it originates from grassroots participants. **Frank challenges (with data) the common Tea Party assertion that Roosevelt’s New Deal reforms failed to halt the 1929 depression (ie that it took the World War II mobilization to lift the US out of depression). Between 1929 and 1933 (when Roosevelt took office), the US GDP dropped by more than 50 percent. Following the enactment of the New Deal, it increased by 11% in 1934, 9% in 1935, 14% in 1936 and 13% in 1937. Overall GDP growth 1933-37 was the highest the US has seen outside of war time.